But even as the weekly forecast takes on a chill, global water and air temperatures continue to rise. And mussels, which settle in intertidal beds for life and can't move to cooler spots, are facing temperatures close to their lethal limit in some parts of the world. To figure out what that limit is, Brian Helmuth is chasing what researchers call refugia: Geographic areas less susceptible to climate change, where stationary animals have a higher chance of survival. "If we have a big heat wave that bakes everything off the shore, there may be animals that survive in some of these refugia," said Helmuth, a Northeastern professor of marine and environmental sciences. Survivors can then repopulate surrounding areas. But as temperatures continue to rise, where might a mussel refugium be? And at what point is it no longer one? Finding the answers starts with tracking the internal temperature of mussels, since, as ectotherms, they can't regulate it on their own. This means that the temperature of their bodies is related to the temperature of their environment, though not so simply. 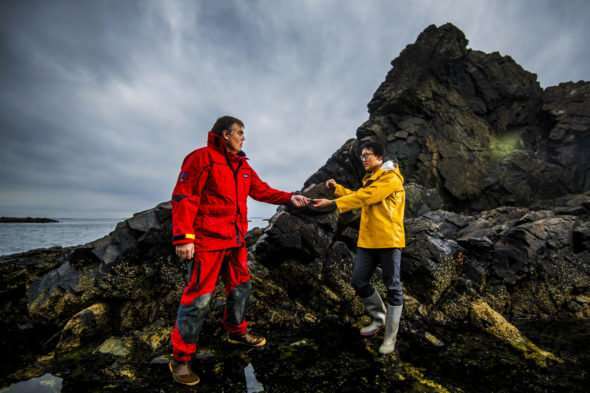 "Air temperature as a proxy is not a good measurement of what body temperatures are for intertidal organisms," said Francis Choi, who manages the Helmuth Lab. As it turns out, a more accurate way to record body temperature is through a "robomussel": Helmuth's own temperature logger that looks and feels just like a real mussel, with all the same thermal characteristics. Made out of epoxy, this device is the same shape, color, and size as the creature about which it's collecting data. That means that it can absorb and release heat in virtually the same way as a real mussel. 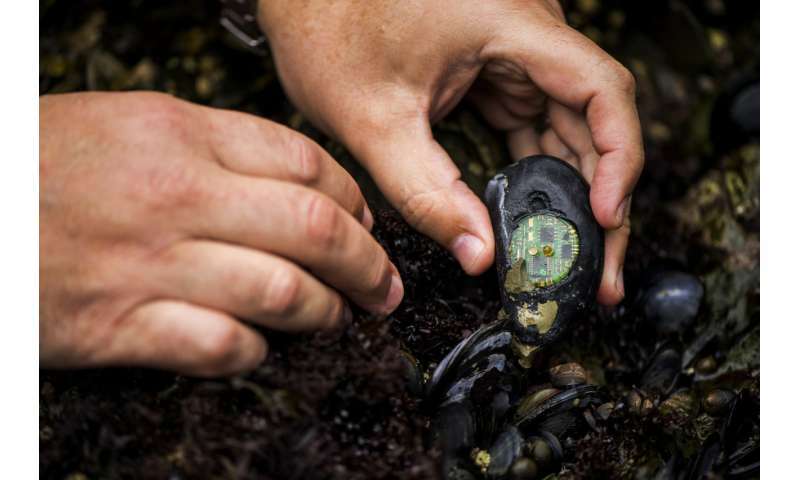 Researchers typically use temperature loggers that don't mimic mussels. But even when embedded alongside the real thing, these loggers can yield temperatures that differ from the mussels' temperature by 14 degrees. Robomussels are much more accurate. "We can get really surprisingly close to what the temperature of the animal is," Helmuth said, "usually within about two degrees." Helmuth first developed and installed robomussels in 1998 in Monterey, California, where he was a postdoctoral student at Stanford University; he's since overseen their installation in 71 sites worldwide. 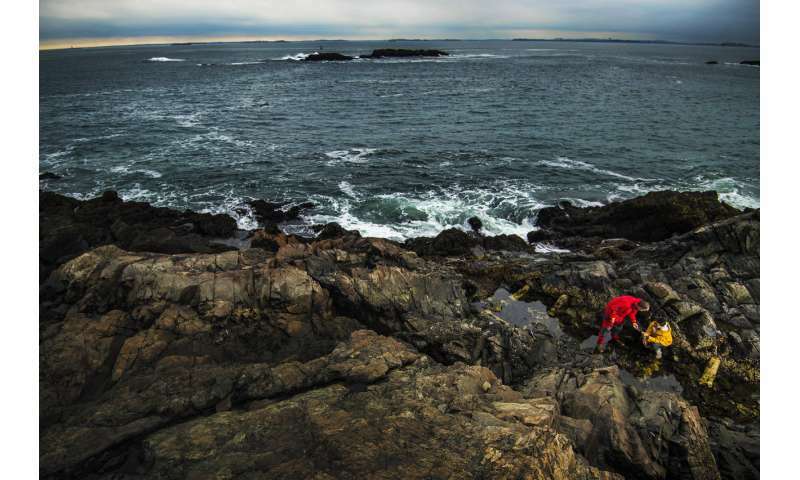 This includes Northeastern's Marine Science Center in Nahant. Coincidentally, the center sits in a region of utmost importance to study. "The Gulf of Maine is warming faster than 99 percent of other large bodies of water on the planet," said Helmuth. Likely because of this, mussel populations from Nova Scotia to Cape Cod are already declining. But with robomussels, these researchers are on their way to identifying safe havens along the world's coasts where mussels can continue to exist—without being fried.